PHUKET: FC Phuket’s new Serbian head coach, Milos Josic, says he is confident that his new-look side will remain competitive as the Division 1 season kickoff rapidly approaches. 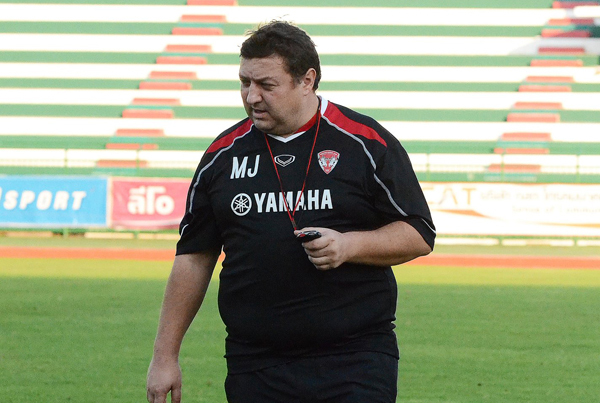 Josic – who coached Raj­pracha Thailand FC last year – and his team began training at Surakul Stadium on Monday (February 20) ahead of their season opener against JW Rangsit FC on March 18. Only ten players were present at the session, with star players Sarach Yooyen, Nene Bi and Niran Phanthong notably absent as they continue their ongoing trial with Muang Thong United. The session was led by returning players Suphat Ont-thong, Watcharapong Jan-Ngam and Thawin Butsombat, along with new faces like Brazilian striker Marcio Santos – who came from Yangon United FC, the Burma League Champions – and Korean winger Lee Won Sup, dubbed ‘K-Pop’ by Phuket fans, from Bangkok Christian College FC. The combination of Lee and Sarach Yooyen on the wings will give Phuket a formidable midfield, Josic said. The Serb said he believes Phuket has the potential to succeed, and is determined to see the side win promotion to the Thai Premier League at the end of the season. When asked about new footballers and whether FC Phuket will bring in any more players, he said that decision is entirely up to team management. He said that his ideal number would be to have 24 players in the squad so he has competition for places, and can push them to reach their best form. Josic is now running two training session per day with his players, at 9am and 5pm. “I am a professional coach, we are a professional team, they are professional footballers, so they must train like professionals,” he said. “They must build their strength and maintain their fitness. Today (February 20) is our first training day so I can’t say much about their strength and endurance, but I can say that my first impressions are very good. He also thanked the fans for their support during the training session. In other news, former FC Phuket head coach Somphong Wattana has signed a contract with Songkhla FC, and said that his team is interested in signing former Phuket goalkeeper Jonathan Matijas, who is currently off contract.